Spied this bottle at Nihon and had to give it a taste. I’ve been reading a lot of reviews and write-ups of the Amrut whiskies and this was the first chance I’ve had to try one. Ok, I’ll admit I was half expecting some exotic, Far-East scents to waft out the glass. Cardamom, maybe? A faint tinge of Curry? The power of suggestion is a…powerful…whatever. Luckily, reason prevailed and I was able to put aside these silly generalizations. 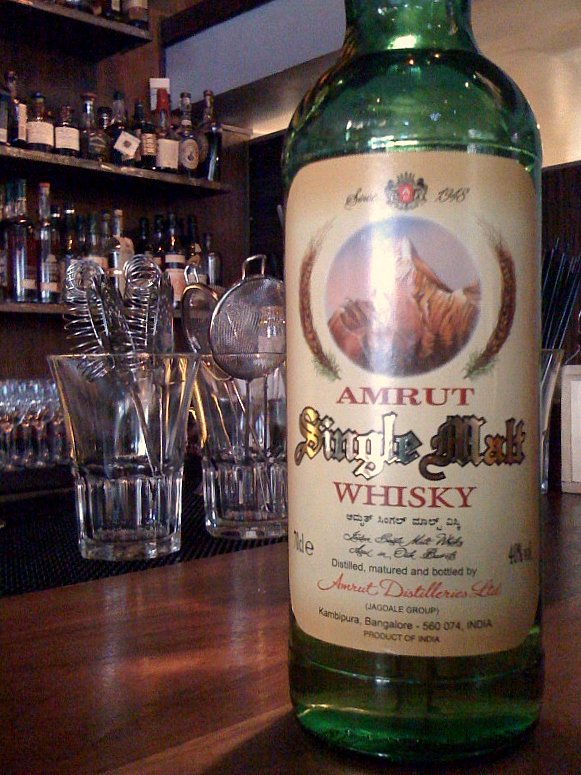 Amrut’s entry-level malt is non-chill filtered and made from barley grown at the feet of the Himalayas in a climate presumably similar to the Scottish Highlands. With no age statement listed, I’m not sure how much time this one has spent in the barrels, probably not too much. The maturation takes place far south, at the distillery in Bangalore, which despite being 3000′ above sea level, I’m guessing is slightly warmer than Scotland and hurries up the aging process just a bit. The Nose: Orange zest & Sweet cinnamon at first, then…a big ol’ oatmeal raisin cookie and a nice soft one at that…probably baked just yesterday. The Palate: Not quite sure how to put this without insulting blends, but this tastes like a blend and kind of a middling one at that. Very grainy. Opens with some cinnamon and spice and has raisin and burnt sugar/molasses notes floating on top, but mostly a rough, slightly woody grain wins out. The Finish: Short, woody and rough, much like this sentence. Thoughts: Mediocre at beast, nothing really stands out here in a positive way, there just are no interesting flavors or nuances to it at all. Interestingly, it’s non-chill filtered which would, I thought, lead to some richer flavors. Not so, barley & grain alcohol play the main role and play it young and rough. Please note that this was an 40% ABV English bottling and probably not the most recent release as the current Amrut Single Malt is listed at 46% ABV. Hopefully the new one’s got a bit more going on than this version. I’ve heard some great things about some of the Amruts, notably the Fusion, and as they make their way into the states, I’ll look forward to trying more of them. Thanks for the honest review. Too many blogs and whisky websites appear to just pass of the distiller’s notes as their own.